As a suitable tribute to a marvelous material, here’s a chair by Colombian bamboo builder and designer Marcelo Villegas. 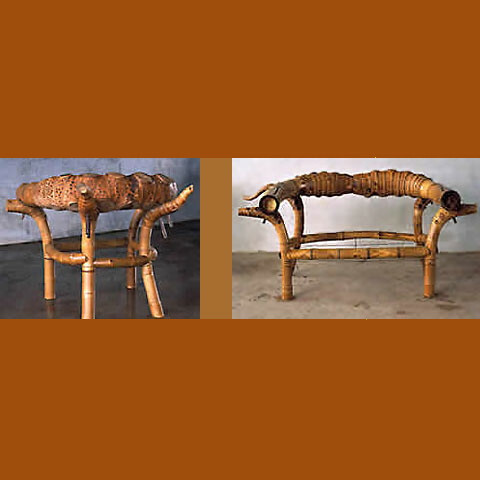 While too much of newly-designed bamboo furniture looks like you have to give up something to use it (like comfort, stability and style, for example), Villegas’ works are artistic masterpieces and fulfill their comfort-functions admirably. We’ve heard that he’s involved in building and furniture design for the Nihiwatu villas expansion project on Sumba Island. Excellent news. Let this be an inspiration to us all, reach for the stars, and build a beautiful bamboo ladder to get there.